Continuing in this tradition, I wanted to include the ability to be notified when other sites post links to my posts. There are several such API's that support this kind of notification, including Trackbacks and Pingbacks. 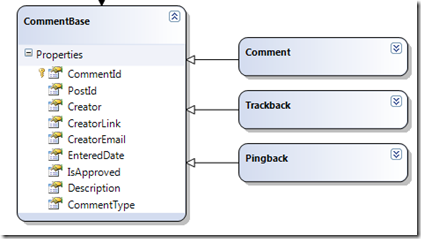 In this post, we'll look at receiving Trackbacks and saving them to our database (using LINQ of course). 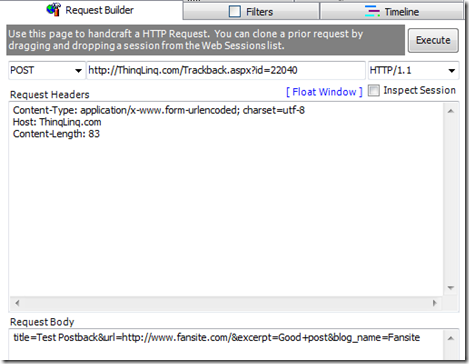 One tool to issue a raw HTTP request to test this is Fiddler. Inside Fiddler, we can select the Request Builder tab. Select "POST" as the method and enter the URI that we wish to post to (http://ThinqLinq.com/Trackback.aspx?id=22040). We then set the content type in the Request Headers and our post content in the Request Body. Below is a screen shot to send this request using Fiddler. On the page load, we need to clear our buffer because we're going to just send a simple XML response indicating any errors we may experience. Next, we need to create the object that we want to persist in our database. We already have a Comment table which maps to our Comments. In many ways Trackbacks are like Comments, so we'll use the same table. Since they do have different behaviors, we'll use LINQ to SQL's ability to support inheritance. Thus we'll add a discriminator column on our Comment table called CommentType and default the value to "C" since most of the items in that table will be comments. Now that we have our new Trackback type, we can instantiate it on our Page_Load with the form values that we get from our page's request fields. We do need to decode the Url encoded values. We also need to watch out for missing values because each of the form values are optional. In this case, we'll use VB 9's support for ternary If. Also notice here that we aren't setting the CommentType field. 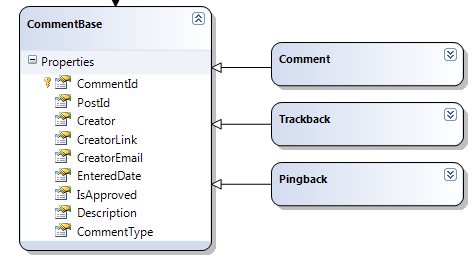 Since we are using the discriminator column and set that in LINQ to SQL's metadata, when we save Trackback objects, it will automatically assign the type to "T" for us. If there were any issues in creating or saving our trackback, we can send the Response.Write(CreateFailureMessage(error)). Feel free to test this by tracking back to this post. Be aware that I am moderating the trackbacks to avoid comment spam that can be inevitable when exposing public known API's like this. Please don't abuse the ability to send trackbacks as I don't want to have to remove the functionality.